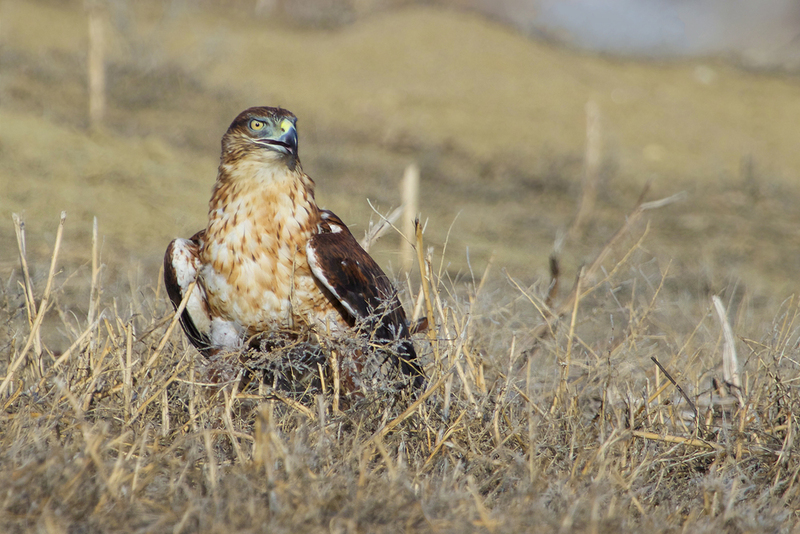 In early February one of our staff members was taking the day to go birding and photographing raptors. She found an injured juvenile Ferruginous Hawk on a low fence post west of Laggerman Reservoir. She was able to get within a few feet of the injured hawk, but the bird flew off into a low tree when she tried to capture it. A week later a Boulder County animal control officer was finally able to catch the hawk. Even though she could still fly, she was growing weak because of her injuries. On evaluation, we found that the hawk had a fractured pelvis and a fractured wrist. It is always amazing to see the incredible will to survive that these magnificent birds sustain, even in the face of such significant and painful injuries. After we saw to all her needs, she was able to rest and heal quickly.Within a few weeks she graduated to a large outdoor flight enclosure. Since leaving ICU in March, she has spent her time recovering, building strength in her muscles, and growing new primary feathers. After a long wait for her feathers to grow, we released her back where she was found this fall.